Most influential brands 2010 index: where are the FMCG giants? We often wonder what the most influential corporations or brands in the world are. To answer this, we need to pass two challenges: how does one define and measure “the most influential”? We searched for a list that could express “most influential”. We believe we found one that expresses this concept: the Thought Leadership index of TLG. With the expression “most influential brand” we mean those brands and corporations that have impact on “opinion formers”. Opinion formers are human beings that, through their own actions and attitudes, shape those of others. They reside within several areas, such as business, politics, media, etc. Those opinion leaders often base their opinion upon the expertise available through organizations. Those companies are conceived and labeled “thought leaders” within a specific industry/sector/subject. “Thought leadership” is often cited as a strategy to build trust in your company and products – which in turn leads to growth. 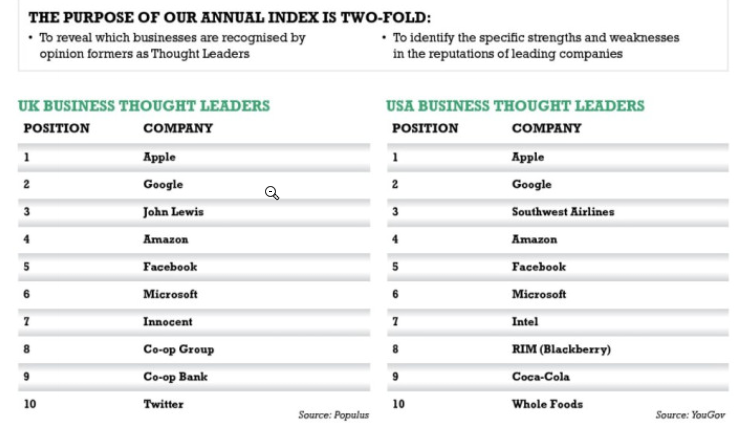 The TLG index lists the “Thought Leadership” top companies aka “the top influential brands”. We believe that the TLG index is based upon a valid method: in-depth conversations with opinion leaders. We don’t have information on who exactly were the “opinion formers”, so one could question whether researcher selected “genuine opinion formers”. Let’s assume they did and analyze the list. Have a look at the list again. There’s not a sign of FMCG concerns such as Unilever, P&G or Nestlé. On the other hand, relatively new corporations with web-focus seem to dominate the list (Facebook, Twitter, Google, Amazon). Do these FMCG groups realize they are not conceived (“decoded”) as thought leaders/influential? Do they need to deploy another communications (pr) strategy? Are they not striving for thought leadership? The latter is hard to believe. Let’s see whether they’re in the 2011 top list! Google: a new phase in brand management techniques? Google is without a doubt one of today’s global brands. What’s remarkable, it gained that position without deploying branding techniques previously known as effective. If one compares the manner by which the Google brand grew to the strategy used by brand institutes like P&G or Unilever, one might believe a new phase arrived. Marketing used to follow this logic: manufacture with the lowest cost and spend money on adverts. This will do the trick. Google (almost) used no adverts (as far as we know). They relied on “viral” and pr to build the brand. Funny aspect: ads are Google’s main source of revenue. It used to be important to have a consistent display of the corporate design / identity. To simplify: the logo has to look always and everywhere the same. Google plays with its logo – expressing change and hence its identity (?). Equally striking are the options to customize your homepage (e.g. by modifying the background). What’s more the corporation itself encourages users to personalize their homepage: have a look at the movie below. Strategy deployed by the big brand institutes was in fact one of “sub-branding”. Every product was conceived as a separate brand. An element that could explain the power of the brand Google is the fact that nothing is in fact sub-branded. Google is actively creating product extensions that all become an part of the brand google (e.g. : Google Mail to Google Maps) to ensure that it can grow beyond search. Other corporations such as Unilever choose to build a brand for each product, ending up with a big portfolio of different brand names. Does this introduce a new stage in brand building? Does this make the profession of brand management totally different?